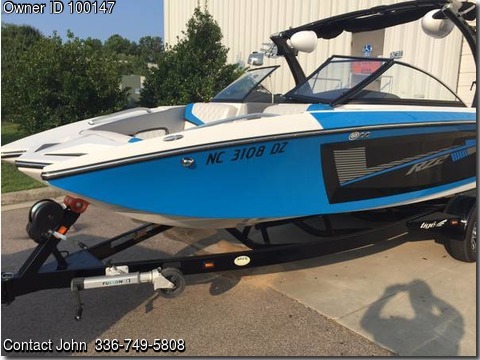 Boat is located in Wake Forest,North Carolina.Please contact the owner @ 336-749-5808...2012 Tiga RZ2 the best surf and wakeboard boat. Key Features: 2,600 lbs Ballast, Tige Touch2, Zero Off, GPS Cruise Control, Alpha Z Tower, Transom Activity Center, Walk-through Transom, Built-In Trash Container, Built-In Ice Chest, Surf XL	2600 lbs plus 800 extr pounds of fat sacks. Width: 102 in, People: 15, Load capacity: 2,445 lb., Fuel capacity: 48 gal., Dry weight: 4,150 lb., Standard engine: PCM EX343 5.7L MPI 343 hp. Boat kept inside year round.It comes with trailer and boat cover.